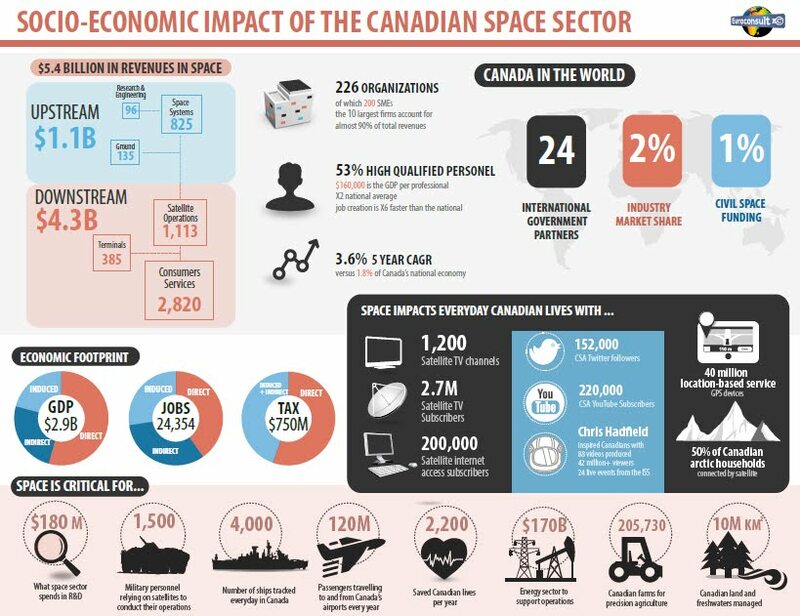 The Commercial Space Blog: Canadian Space Agency Releases "Comprehensive Socio-Economic Impact Assessment of the Canadian Space Sector"
Canadian Space Agency Releases "Comprehensive Socio-Economic Impact Assessment of the Canadian Space Sector"
The Canadian Space Agency (CSA) has released a report on the "Comprehensive Socio-Economic Impact Assessment of the Canadian Space Sector" in an effort to "capture the economic argument for investment in space." Infographic charting the socio-economic impact of the Canadian space sector from the "Comprehensive Socio-Economic Impact Assessment of the Canadian Space Sector." Source c/o Euroconsult/ CSA. The 97+ page document, costing just under $250,000CDN to create under contract to the Montreal, PQ based office of Paris, France based Euroconsult, called Canada a "pioneer in the development and application of advanced space technologies," such as advanced communications satellites, synthetic aperture radar and space robotics technologies, but also categorized the country as having "lost its place" among the world's leading space programs. According to the report, "the Canadian space sector is comprised of over 200 organizations involved at different levels of the space value chain and employing a total of 9,784 workers involved in a wide array of highly qualified jobs. It is estimated that this sector generated cumulative revenues of $5.37 billion in 2013 when taking into account Canadian satellite broadcasting activities, and $2.63 billion when excluding these activities." These numbers are substantially higher than the last publicly released assessment of the Canadian space sector, the 2013 State of the Canadian Space Sector Report, which was compiled by the CSA and released in December 2015. However, the majority of the difference between the two reports could be caused by the different reporting methods. The Euroconsult report was developed using methodologies developed by the Paris, France based Organisation for Economic Co-operation and Development (OECD), as defined in their March 2012 publication "OECD Handbook on Measuring the Space Economy." Dated March 2015, but only released to the public on June 3rd, 2016, the origins of this Euroconsult/ CSA document go back to 2014. As outlined in the August 14th, 2014 post, "Space Agency Seeks Insight into Space Industry," that's when the CSA solicited bids from "qualified suppliers" to undertake a "comprehensive socio-economic impact assessment" of the Canadian space sector. The final, perhaps more practical objective, was to "capture the economic argument for investment in space." To judge whether or not that objective was achieved, simply click on the screenshot above and download the report. Screenshot c/o Euroconsult/ CSA. The CSA data came from an internally derived CSA methodology which was never made explicit to outside observers, and didn't really satisfy even the CSA and its supporters. When the final 2013 State of the Canadian Space Sector Report was released in December 2015, page four of that report noted that future reports on the Canadian space sector would be expected to follow OECD methodologies. Although a G7 country, Canada dedicates much less of its GDP to its civil space activities than the world average. Its baseline funding will likely not enable Canada to maintain its space capabilities in the long term. In addition, budget instability and unpredictability affect the most fragile players, especially SMEs that form a critical part the Canadian space sector’s ecosystem. When taking into account defence, the Canadian government’s total investment in space has actually increased quite significantly. However, the return of these investments remains limited for the Canadian space sector as a large part is spent on foreign programs. Considering the scale of the investments, this is a non-negligible shortfall for the Canadian space sector. Canadian government investment in space has not always supported domains showing high market potential, limiting the possibility to turn this initial investment into larger economic gains for the space sector. As result, several industry players have been progressively pushed away from the Canadian space program. It's important to note that many nations believe the economic argument for investment in space has already been successfully made. 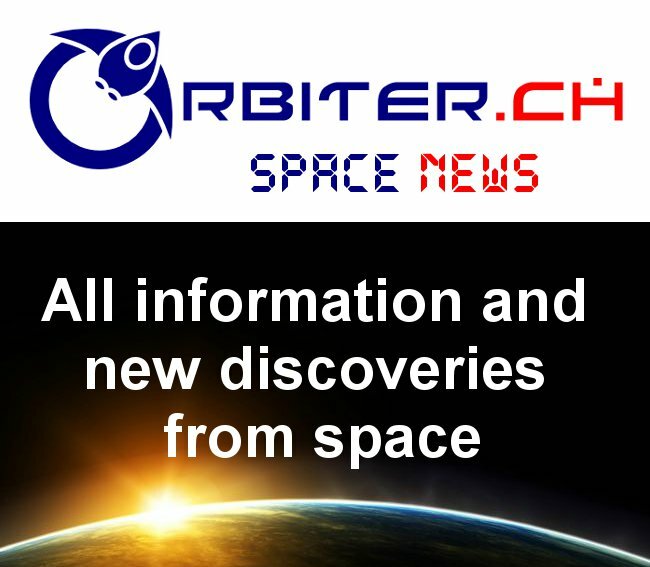 A recent example, as outlined in the June 4th, 2016 Wall Street Journal article, "Luxembourg Sets Aside Funds for Asteroid Mining Push," is Luxembourg, where deputy prime minister Etienne Schneider said in an interview Thursday that his government had set aside roughly €200Mln Euros ($328MLN CDN) in public funds to support commercial space ventures. As outlined in the December 14th, 2015 post, "UK Space Policy Follows US Down the "NewSpace" Path," other countries are also investing in space and passing legislation encouraging private sector investment. Screenshot c/o WSJ. Many successful companies focus on the export market which can represent up to 90% of their revenues, with little dependency on government R&D or support programs. While a sign of commercial maturity, in the longer term it could create a risk for business sustainability and key technological capabilities and furthermore cause a disconnect between industry technological capabilities and government national requirements. The Canadian industry has made significant investments outside Canada, including foreign acquisitions and the implementation of facilities in other countries. While it shows the dynamism of the largest Canadian companies, they choose to invest outside Canada to grow their business. Conversely, Canada does not attract enough foreign investment in its space sector, whereas this would provide additional capital and grow its technology base. As outlined, most recently in the March 23rd, 2016 post, "India is also Building Reusable Spacecraft," Canada has been losing ground since 2010 to other national space players such as Brazil, China, Israel, Japan and South Korea, who either already possess or are in the process of developing, the capability to launch satellites into orbit using domestically developed rockets.